Morning Lemmings and a word of warning: From here on in the photoshops are going to start getting really weird. Think about it this way… I’ve been doing this for about a year and as has become apparent, Question Time is littered with repeat offenders (Dianne Abbott, I’m looking at you) who seem to be on every other week. As a result, I’ve pretty much scoured Google Images in its entirety for fresh raw materials with which to poke topical fun at the great and the good, but it has become clear that this seam has been mined to the point of exhaustion and I will have to fall back on the absurd to make ends meet. I blame Labour. I wouldn’t have had to make these cuts if they hadn’t been running up such an astronomical Google Images deficit in the good times and clearly we don’t want this blog to go the way of Greece, Spain or Ireland. This is me taking us out of the Danger Zone. Anyhoo, on to the show which this week (for the most part) seemed to have been filmed two years ago in an era where old certainties held true and our heads were not spinning from the unpredictabilities of coalition. In many ways, it was like the Cold War but with slightly different belligerents, full Technicolor and a very different outcome. Allow me to explain. First in our trip down Memory Lane is Francis Maude, Minister for the Cabinet Office and Paymaster General, who by rights should be playing the role of post-war America (confident, powerful and marching to the beat of inexorable progress) but is, in actual fact, now portraying the sorry vision of Hoover era America (unsteady, insular and without a song in its heart). He got the ball rolling by falling back on some good old Tory Values of Yore with the prisoners question and lost little time in throwing round words like “repugnant” before doing his best to divest himself of any substance when it came to multiculturalism. After this less than promising start, he then collapsed into a fug of isolationism as he toed the current Western line on Egypt (‘complex stuff, best not rock the boat and all that’), all of which ultimately amounted to very little. Little did he know that he was about to get hit by his own personal Great Depression, but a little more on that later. Next up we have Jacqui Smith, filling the shoes of an increasingly warped, probably-evil and definitely mad dictatorship who has just lost its patron state. Think North Korea or Albania. Again, she seemed to be still rooted firmly in the past, believed she was still Home Secretary and capitalised handsomely on the opportunity to remind us of all the things we didn’t like about Labour by getting all ‘tuff on crime’ when it came to prisoners, muddying the waters with a bucket of terrorism on the multicultural question and then pretty much sidestepping Egypt in the same way Maude did, all of which was crap. Again though, there was drama just around the corner, but be patient… we’ll get to that soon. Last on the list of our Cold Warriors is Menzies Campbell who, by all appearances, has been asleep since last April and has to yet to be informed that his party is in government with the Tories. This is probably for the best as I can only imagine what he’d like to do to Nick Clegg if he ever found out what he’s been up to of late (see Fig.1) and given his advancing years, I’m not sure if that would be good for his blood pressure. In this scenario, Ming takes the role of the out-there, edgy, and possibly-progressive regime that fires up the spirits of young revolutionaries everywhere, sort of like an only-just-post-revolution Cuba or Nicaragua just after Somoza fell. Hoisting the banner of Liberty, Ming took to the barricades on the prisoners issue, staunchly defended multiculturalism and at least venturing a solid opinion on Egypt, all of which reminded us why we used to like the Liberal Democrats and made me positively yearn for the days when wouldn’t even dare dream of power. More on him later, but as we all know, a Cold War needs an ideological struggle to underpin the narrative and aptly fulfilling this need are Mehdi Hasan, our alternate history’s Rabid Pinko Commie and Douglas Murray, our Pig Dog Capitalist Lacky. Now, these guys were much more fun than the geopolitical players and were at each others throats when ever the opportunity presented itself. For the most part, Hassan emerged the victor as he managed to maintain sufficient anger to come across as passionate, but keeping it just about in check enough to stop him looking like a nutter (something which has dragged down his score in past episodes). Murray, on the hand, actually looked quite ill and a little dishevelled, but if he was feeling worse for wear, that didn’t stop him from coming out all guns blazing. The best bit was on the multiculturalism question where Murray kicked off by regurgitating an article he had written for the Wall Street Journal this week and generally damned the whole concept to hell and back. This drew a fair bit of applause, but he was then given the beat down by a pissed off Hasan who invoked the spectre of Nick Griffin and garnered an even louder round of claps. This went back and forth for a bit but eventually ended in almighty kerfuffle that Dimbers was forced to break up with assertive use of the word “Order!”. That’s some good Question Timing right there. It all started inauspiciously enough with Murray using the question as an excuse to bash the lazy and feckless around the chops while Smith used it as excuse to reel off a list of past Labour policies that no-one gives two hoots about any more. Then it came to Francis Maude and the first glimpse of a mushroom cloud hove into view as he blamed everything on Labour. Boom. That was it. The crowd, who had already been quite volatile got to the point of criticality and absolutely exploded. Hands down, this was the biggest boo-fest of the current run and despite some counter-booing from a few section of the audience, Maude was right at Ground Zero. Things got even worse when a psychotherapist set off some secondary explosions while Murray did his best to stoke the inferno by accusing the nation of being “morally obese”, further exacerbating the situation and forcing Dimbers to wade in again and break it all up. Despite his best efforts, the firestorm raged on and when the show ended, it seemed certain that we had been plunged into a nuclear winter for the next decade. Now that’s rattling good history. Should have ducked and covered. 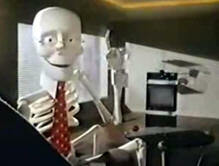 Looks like the skeleton from the Scotch Video Tape adverts. Morning Lemmings and a word of warning: From here on in the photoshops are going to start getting really weird. 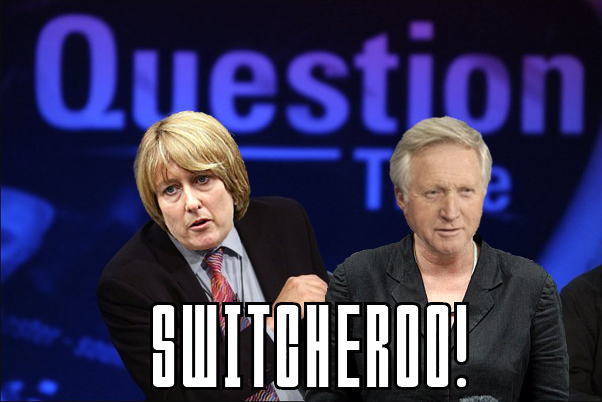 Think about it this way… I’ve been doing this for about a year and as has become apparent, Question Time is littered with repeat offenders (Dianne Abbott, I’m looking at you) who seem to be on every other week. As a result, I’ve pretty much scoured Google Images in it’s entirety for fresh raw materials with which to poke topical fun at the great and the good, but it has become clear that this seam has been mined to the point of exhaustion and I will have to fall back on the absurd to make ends meet. I blame Labour. I wouldn’t have had to make these cuts if they hadn’t been running up such an astronomical Google Images deficit in the good times and clearly we don’t want this blog to go the way of Greece, Spain or Ireland. This is me taking us out of the Danger Zone. First in our trip down Memory Lane is Francis Maude, Minister for the Cabinet Office and Paymaster General, who by rights should be playing the role of post-war America (confident, powerful and marching to the beat of inexorable progress) but is, in actual fact, now portraying the sorry vision of Hoover era America (unsteady, insular and without a song in it’s heart). He got the ball rolling by falling back on some good old Tory Values of Yore with the prisoners question and lost little time in throwing round words like “repugnant” before doing his best to divest himself of any substance when it came to multiculturalism. After this less than promising start, he then collapsed into a fug of isolationism as he toed the current Western line on Egypt (‘complex stuff, best not rock the boat and all that’), all of which ultimately amounted to very little. Little did he know that he was about to get hit by his own personal Great Depression, but a little more on that later. Next up we have Jacqui Smith, filling the shoes of an increasingly warped, probably-evil and definitely mad dictatorship who has just lost it’s patron state. Think North Korea or Albania. Again, she seemed to be still rooted firmly in the past, believed she was still Home Secretary and capitalised handsomely on the opportunity to remind us of all the things we didn’t like about Labour by getting all ‘tuff on crime’ when it came to prisoners, muddying the waters with a bucket of terrorism on the multicultural question and then pretty much sidestepping Egypt in the same way Maude did, all of which was crap. Again though, there was drama just around the corner, but be patient… we’ll get to that soon. Agreed. The whole Maude/Smith schtick was just a mind-numbing replay of yesterday’s chip-wrap, enlivened only by Ming’s (actually quite lively) meanderings and the ill-tempered sniping between Hasan and Murray. Sadly, the multicultural issue suffered from more heat that light – although I can’t pretend I’m surprised. That one will run and run. But the Bristol boo-fest was a delight. I was deeply proud of the city that was my educational alma mater. Also not a little proud at having predicted exactly this reaction in a response to one of your earlier Match Reports. “It’s all the fault of them as we inherited the mess from” is a card that very rapidly ceases to trump. Love the dinner money PSP. They did good did Bristol, making a right pair of kippers out of Maude and Smith… Your pride is justified! Also very nice to see Ming trapped in a timewarp… There’s dignity in giving up giving a toss. 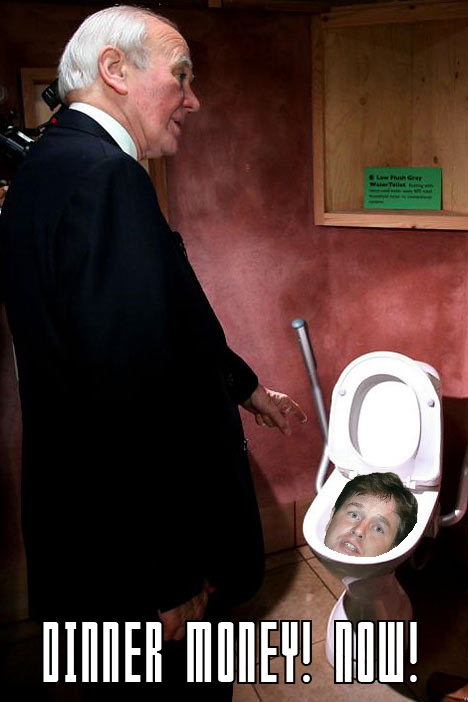 Next time he’s on, I’ll see what else we can squeeze into his toilet bowl.